It’s a rite of passage almost no one will escape: the difficult, emotional journey of downsizing your or your aging parents’ home. 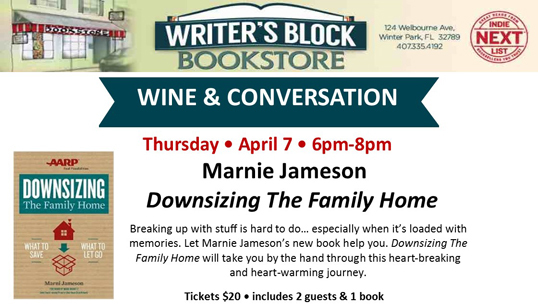 Here, nationally syndicated home columnist Marni Jameson sensitively guides readers through the process, from opening page that first closet, to sorting through a lifetime’s worth of possessions, to selling the homestead itself. Using her own personal journey as a basis, she helps you figure out a strategy and create a mindset to accomplish the task quickly, respectfully, rewardingly—and, in the best of situations, even memorably. Throughout, she combines her been-there experience with insights from national experts—antiques appraisers, garage-sale gurus, professional organizers, and psychologists—to offer practical wisdom and heartwarming advice so you know with certainty what to keep, toss or sell.